A couple of weeks ago, in the Czech Republic / Portugal match, Cristiano Ronaldo clanked an open shot off the post at the tail end of the first half. Visibly frustrated, the well known footballer and model looked and shouted at the heavens. Upset for his poor fortune, missing a relatively easy shot. It was a striking image. This insanely talented, gifted, and privileged superstar - a Portuguese Arod - angry that God wasn't looking out for him at that moment. Could anyone feel sympathetic for this character? The San Francisco Giants have a sympathetic figure in seemingly fallen world beater, Tim Lincecum. It's not easy to feel sympathy for a guy in his 20's, who's living the good life and set up for generations, but we've always been huge fans for what Lincecum did on the diamond. Since his meteoric rise through the minors, culminating in back-to-back Cy Young Awards and a World Championship, we've admired and appreciated the electric stuff every time The Freak took the mound. While clearing the notebook last week, we noted how Tim Lincecum's ERA was out of whack. Unfortunately, after today's beatdown from the Pittsburgh Pirates, he's headed into the All-Star break with a 6.42 ERA, the worst among all pitchers who qualify for the ERA title. Lincecum's OBP-allowed career is also trending poorly. "It’s been terrible. It’s a terrible feeling. You feel like you’re letting your team down. That’s the hardest thing. It seems like everybody else seems to be doing their job and playing good ball. When you’re the weaker link, you kind of look at that and it wears on you. So you try your hardest to work out of it. I’ve been working hard four days between starts, putting the man hours in there, which also makes it tougher to swallow." Human beings, no matter how wealthy and protected can suffer at every level. Feeling like a weak link, powerless, and pitiful can happen to anyone. When it's a person who's enjoyed extreme success for as long as he or she can remember, it's safe to imagine the sting of failing for the first time hurts more than usual. Lincecum's velocity is way down. His average fastball velocity is 1.7 mph lower than last season's, and more than 2.1 mph below his career average. A non-negligible loss in velocity traditionally portends an injury. Tim Lincecum is too young to be completely shot, but he may need to learn to pitch with a different arsenal of pitches. He'll need to adapt his approach, but the list of pitchers who reinvented themselves and found success while dropping from mid-90's to upper-80's, is long and distinguished. 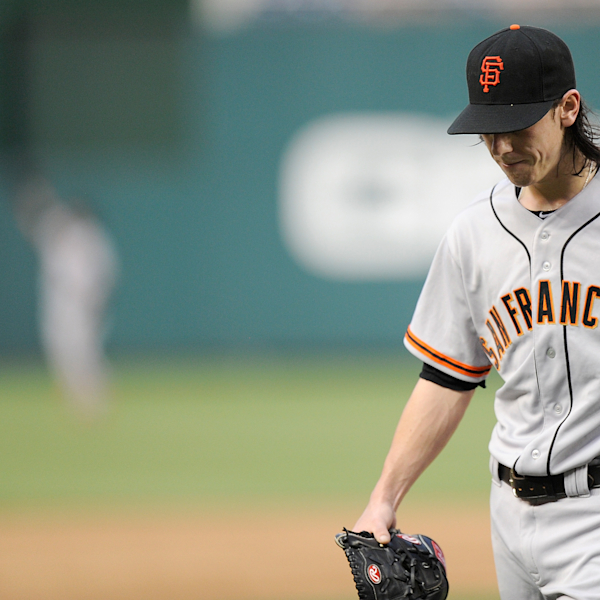 Tim Lincecum may want to see if Barry Zito has any advice.